Every entrepreneur thinks about their next client almost daily. The photographer is no different. We wonder who they are, what they want, where they will be coming from and how we can serve them in a way to make them return to our business. American Society of Photographers would like to help you understand their needs, so that finding them seems a little easier. Through the summer, we will be reaching out to potential photographic clients, asking them the questions you would like to know and compiling the data for YOU. ASP wants to see you soar, and we are here to help you do it. Help us to compile this information by telling us what you would want to know from the general public as well as providing us with information of people to be surveyed. The information needs to consist of email address, gender, city, state and zip of the person surveyed. These emails must be current, working email addresses of a potential portrait client. Some great ways to find these lists are through your chamber of commerce, businesses that you partner with, such as a builder or a baby boutique, and of course, your own client list. The more people you can provide from your area, the better results we will be able to give you for your specific studio location. We want to reward you for helping us. Provide us with 250 email addresses of potential portrait clients and we will give you a one page custom analyzation of how to market your business based on prospective client’s needs in your area. 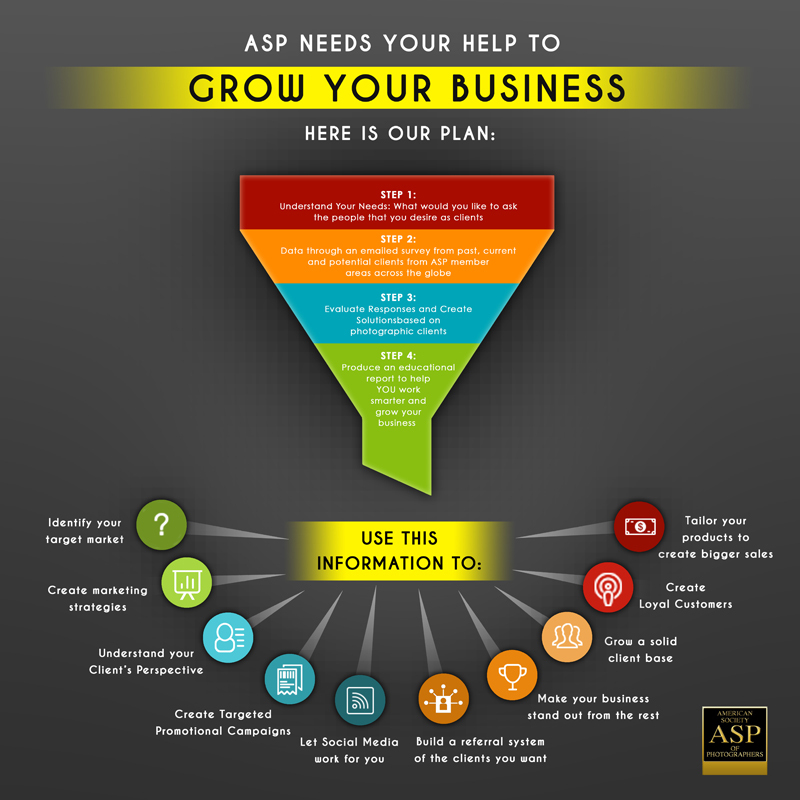 Your marketing analysis can be picked up at the ASP booth at Imaging USA, 2018 in Nashville. In November of 2016, ASP conducted a comprehensive study and surveyed our members. 87% of those surveyed expressed that they had trouble, or didn’t know how to reach their potential clients and turn them into customers. We look forward to working with our members to help you solve one of the biggest mysteries in business. You asked for it and we are happy to help! Follow these links to start your road to success! Submit your email list and let us do all of the work! Click here for sample text to send your own email to your clients. Questions? I would be happy to help! Just email me at leslie@savantphotography.com with questions or comments.